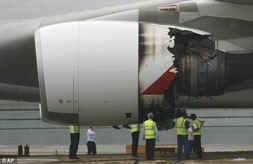 “Qantas Jet Explodes Over Indonesia” blared the headline on the New Zealand Herald website yesterday. Once again the media went into panic mode as it scrambled to keep pace with a flurry of reports that were popping up through social media sites. Indonesian sourced Twitter content describing an explosion and aircraft debris raining from the skies were interpreted incorrectly as an aircraft having exploded in the air. Does this sorry episode and the recent media debacle over The Hobbit suggest that traditional forms of media are more frequently substituting sensationalism in the place of research and accuracy, as they struggle desperately to compete with the immediacy of new forms of digital media? The last remaining vestiges of New Zealand journalistic credibility also exploded yesterday. Traditional media seem ever willing to cater for the public’s demand for reality based entertainment and hunger for death and destruction. What really happened in the sky yesterday was that an uncontained explosion in one of four engines of a Qantas A380 shortly after take-off from Singapore led to the aircraft entering the holding pattern and dumping fuel overhead Batam in preparation for landing. Some engine debris was recovered on the ground but due to the qualities of the Airbus aircraft, there was no loss of structural integrity and the crew followed correct procedures, returning to land safely. A properly researched headline should have read “Flight Crew Performs Textbook Emergency Landing – 450 Safe”. Wellington media maven, blogger and Fairfax journalist Greer McDonald will be speaking at Social Media Club on Monday evening about how traditional media treat information received via social media channels. This is sure to be an interesting and lively discussion given recent events and the fact that Greer has a foot firmly in both camps. ideegeo’s successful launch of iWantMyName as a global domain registrar site and the opening of sites for Germany and the Netherlands last year were exciting milestones in the evolution of iWantMyName into a highly scalable industry-wide platform solution and in the development of our company. Although our focus was global from day one, we felt it was now time to turn our attention to home. We had many requests from our friends to establish in the New Zealand market, because of our unique service offering, friendly user interface and great customer support. Finally we just had to say yes and so we now have a dedicated Kiwi site offering fixed prices in New Zealand dollars. The Kiwi iWantMyName has by far New Zealand’s widest range of domain extensions, many of which are unavailable from other local domain registrars. Examples of exclusive domains include the recently launched .TEL and .ME suffixes plus interesting country code top-level domains from all over the world such as .LI (Liechtenstein), .IO (British Indian Ocean Territory) and .FM (Federal States of Micronesia). Customers from the existing site can use the same login details to access their accounts across the iWantMyName platform suite. We also offer the same free services on our Kiwi version so that you can hook up your own domain to customise a wide range of great web applications such as GMail, Blogger and Zoho. In the very near future we also plan to add some cool new Kiwi-made services that we really want to support. We think it is appropriate that the launch of a new product should be celebrated with some special offers. So until the end of February we are offering new .COM, .NET, .ORG and .NAME domains for only $19.90 NZD plus .INFO for $9.90 NZD. We are also able to offer a FREE one year extension if you transfer your existing domains across to iWantMyName NZ. Transfers can be handled from your personal dashboard once you join up. Please note that all domain prices quoted on the Kiwi site are GST exclusive and that we provide full GST invoicing to all our valued customers. The reported acquisition of Wellington based Bookhabit by Los Gatos company Smashwords is an encouraging development. It demonstrates that we can incubate attractive, high value web-based ventures and get noticed globally. About 18 months ago I was involved in some consulting at Bookhabit, working on building their user community. It was a great experience and a good lead in to my next project, which was of course, starting up ideegeo and then launching our domain registrar software platform iWantMyName. Perhaps the most useful lesson from that experience was observing just how much hard work is needed to to gain traction with a start-up business. On that basis I’m tremendously pleased for Clare Tanner and her partners at Webfund, who I know put in a lot of hours to build their business. I’m also pleased to hear from Webfund that the company remains strongly committed to supporting the Wellington technology scene and that they are keen to work with Clare and others on future projects as they look to reinvest. But, last week I was reading the painful story of a New Zealand biotech start-up that flushed tens of millions of dollars down the drain through mismanagement and bad luck. Why aren’t we playing to our strengths? The set-up cost for a web technology venture is a fraction of that for biotech and the innovation wavelength on the Web is a lot shorter. We can spread the risk by funding 50 Bookhabits for every single biotech punt. That is why ICT specifically needs to be back on the national economic development agenda. Its that time again already. Next week’s Wellington to the World event (W2W) picks up where the inaugural event left off in 2008. W2W is the leading annual showcase for New Zealand’s digital innovation at a time when strengthening our entrepreneurial ecosystem has never been more important and topical. The event gathers technology innovators, entrepreneurs and investors for product pitches, new ideas and networking. The theme for the event is “Going Global with Your Tech Business”. If you are a technology entrepreneur or investor you should be at this event. Speakers include Richard MacManus, founder of ReadWriteWeb and one of the world’s most influential tech bloggers. Nanotechnology researcher and Young Scientist of the Year, John Watt will also be there. MC for the half day event is Ben Young, author, entrepreneur and marketing wunderkind. 1. Cultivate a community of trust. Demonstrating industry knowledge, showing moral and ethical leadership and delivering on product promises are fundamental keys to success. 2. Offer an exceptional user/customer/reader experience. Consumers have a lot of choice already. Why would you aim for mediocrity when you can have excellence? 3. Network. Connect in both the real world and online. Think – what can I learn from this person and how can I help them in return? What can our company do to help build communities? 4. Enjoy the journey. If you are looking toward the sky, you are more likely to find a rainbow. So find a project that you will enjoy doing. If you follow these four rules and build a good team around such philosophies, you will have substantially improved your chances of success in going global. These are not the only rules of course, but it is a good starting point. Are there any other rules you would like to add? The vexatious issue of online identity becomes steadily more and more intractable with the staggering growth in the number of Internet and mobile users and the proliferation of web-based communities and online applications. But the problem of online identity goes well beyond simply finding a ubiquitous login profile for all your favourite websites. Technology now controls and mediates the permeable boundary between communities and a growing number of services. Dealing with the technology around online identity involves addressing important issues such as verifiability, security and reputation. In difficult economic times the expression of our online identity holds considerable value, because it may affect our ability to find a job or win a contract. Centralising the protection and management of online identity then seems like a logical step towards solving some of these issues, but it also brings with it some philosophical problems. If you entrust your personal data to a single organisation how can you be sure that it is secure? Is it better to have a multiple identities and logins? If your favourite social networking site went bust tomorrow you may lose some data but at least all your other identities remain intact. Could access to personal data be abused if it was located in a centralised repository? Would it mean more or less spam and invasion of personal privacy? What happens to your data in perpetuity? The reality is that we are already struggling with these issues. If you own a telephone, get a welfare benefit or operate a motor vehicle – your personal information already resides on numerous databases around the place. Almost certainly some of that information is incorrect and you don’t even know it. Recently I had to make two personal visits to my bank to make a simple address change happen! Last week’s launch of the new .TEL domain was a positive step towards allowing Internet users to regain control over their online data. The launch of .TEL received little coverage in New Zealand, despite the tremendous opportunity it represents. The new domain was set up by Telnic, a respected global domain registry. 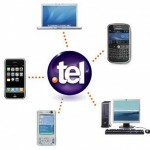 Each .TEL domain comes with it’s own free website that the owner can configure to display contact information. Here’s how the ideegeo .TEL site looks for example. You can also add active links such as phone numbers, email addresses, related websites, blogs and personal social network pages. Over time .TEL will grow to become the equivalent of the world’s virtual White Pages and no doubt a myriad of application offerings will spring from within it. It seems like the perfect way for small businesses to get listed on the web without the expense of developing and managing a full blown website. The domain owner has full control over the page content and level of access by other users (public or private). If there is any change of address or other contact details it is a simple matter to update the site. The .TEL sites are protected by high level encryption to keep spammers and cyber-criminals away. The .TEL launch included a funny video that alludes to some light hearted social benefits from becoming a .TEL owner. We’ve been promoting the clip on our iWantMyName domain management site this week. Enjoy. Is There Any Money In Social Media? Last week I engaged in a blog discussion regarding how Twitter will monetise its service offering. It got me thinking about social media in general and about whether or not such products can ultimately generate value for their investors. I probably caused some mild offence by suggesting that social media sites need to think beyond the Google ads model as a revenue driver. Shouldn’t delivering value to the user be the prime motivation for site owners? I find it quite bizarre that so many site owners are obsessed with driving traffic to their sites in order to squeeze out a few more cents of revenue, on the basis that a tiny percentage of users will click on some ugly random ad words placed strategically around the site. Oddly, nobody seems to question this model. At this point I should probably point out that I don’t own the ads you may have seen at the top of this page sometimes. In fact if I had my way I would gladly pay to keep them off site because of the devaluing effect they have on my own brand. So notwithstanding the irony that paying to remove ads has now become a valid revenue model in itself, I reckon there are a lot more creative ways to make a social media site pay. The most obvious option is the multi-tiered subscription based approach whereby users can receive a basic level of service for free and choose to pay for additional services. Dating sites are probably the most popular example of this approach and my friends over at Smallworlds are taking this track too. The second approach is to sell something for which there is a demonstrable need and do it in a stylish way that carves out a niche. That’s what we are doing with iWantMyName. But how can sites like Twitter earn cash when they don’t appear to have anything tangible to sell apart from access to their network? Twitter has so much cash to burn that there is no urgency to find a revenue model – yet. Building trust and growing the user community is far more important than spamming users with site ads at present. There have been quite a few ideas floating around about how Twitter will monetise but many of them are red herrings. I believe Twitter does have a plan and the key lies in the fact that the interface is so clean and simple at present. By offering only limited functionality now it creates a fertile ground to add revenue generating value drivers downstream. I think contextual search will play a big role in the approach that Twitter ultimately adopts and other site developers should watch and learn as this evolution occurs. Twitter is ripe to move into an enterprise setting too, but it cannot do this until there is much better search functionality. Microblogging may not replace email entirely in the future, but it certainly will put a big dent in it. How long will it be before you can add images and document attachments directly to your Tweets? What I love most of all about micro-blogging services is that I have complete control over who I subscribe to. That is a feature people will pay for and that is the one problem that regular email software can never properly address. On that basis alone I think micro-blogging services will eventually win as opposed to stepwise adaptation by the encumbent technologies.